Soundmat PBM with black matte film, combines absorption and decoupling layer with a noise barrier. Ideal for lining engine rooms and generator housings. DYAD, a polymer specifically developed to provide effective constrained layer damping on thick structural metal plates. Soundcoat can provide absorption, damping, barrier and gasketing materials alone or in combination to form multi- layer composites. If you are faced with a noise problem that requires high temperature or conductive adhesives, special facings for harsh environments, or Class A fire rated and non-toxic absorption materials, Soundcoat can help. 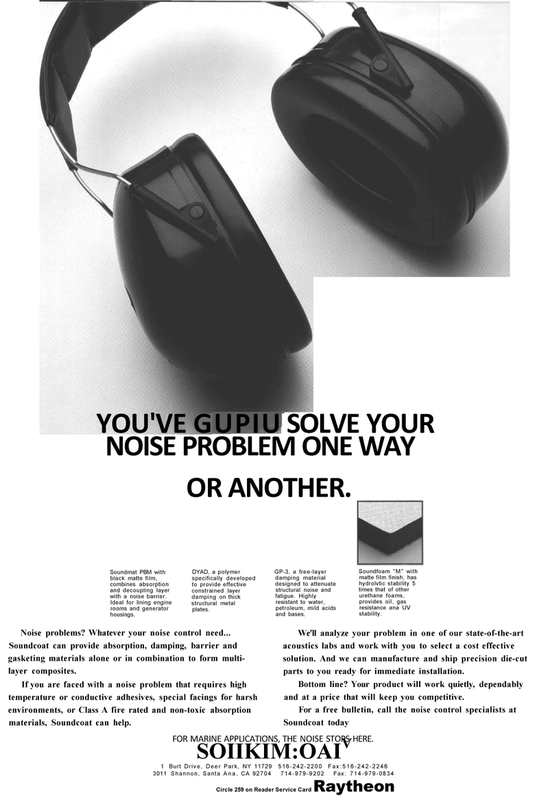 GP-3, a free-layer damping material designed to attenuate structural noise and fatigue. Highly resistant to water, petroleum, mild acids and bases. Soundfoam "M" with matte film finish, has hydrolvtic stability 5 times that of other urethane foams, provides oil, gas resistance ana UV stability. We'll analyze your problem in one of our state-of-the-art acoustics labs and work with you to select a cost effective solution. And we can manufacture and ship precision die-cut parts to you ready for immediate installation. Bottom line? Your product will work quietly, dependably and at a price that will keep you competitive.